Annnnnd, they’re back. 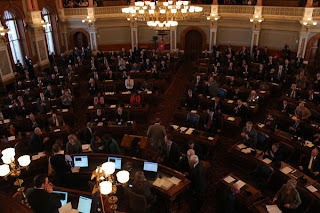 Judging from all the feel-good-y status updates in my Facebook feed, conservatives are expecting good things during this session of the Kansas Legislature. I wish I shared their optimism. The sentiment is that we have a more conservative legislature than we’ve ever had. I think it’s still far too early to tell. Saying you’re conservative and voting like one are two different things. I have been exceedingly disappointed in the early ideas and topics I’m hearing discussed. I’m hopeful that things like a second round of re-districting (ARE YOU KIDDING ME?) and the Governor’s new mental health initiative take a back seat to other, more important issues. I never underestimate the ability of Republicans to mess things up. (Sadly, I’ve become a horrible cynic in my (ahem) years on earth). Conservatives should work immediately and decisively to change the way Kansas judges are appointed. This would move the needle in ways our conservative legislature never can. Right now, whenever liberals have an issue of concern, they run to the nearest liberal district court and simply work around the legislative process. It is unacceptable, and if conservatives are ever to make meaningful in roads, this must be addressed. We may never have a better opportunity, and it needs to happen in 2013. The following year, 2014, will be an election year, which means most legislators will have their girdles strapped on too tightly worrying about getting re-elected. Speaking of activist judges – kind of – no change would be as meaningful or long-lasting as breaking the public school system monopoly in Kansas. Our public schools are little indoctrination camps in which teachers mold students into little, group think robots. Yes, that’s strongly worded, because it’s true. In my opinion, this, in public school classrooms, is where conservatives lost the battle – maybe even the war – for the heart and soul of this nation. Kansas legislators have a rare opportunity to do something about it. It will take great courage. Teachers aren’t going to like it. School PR people aren’t going to send happy notes about it home in backpacks. I hope and pray this crop of legislators (and the governor) has the backbone to address this issue. I have my doubts. As a by-product, I would be less irritated by the court dictating $4,492 per weight-student, if I got to choose which school got my money. Finally, the budget issues must be addressed. I hope we’re on the right track here, headed to a future with a flatter, fairer tax code. But we’ll see.